Nitin Fire Protection Industries plans to expand its footprint through new acquisitions and become a billion-dollar company by 2020. Most companies have a breakthrough moment - something that puts them on the path to their true potential. For Mumbai-headquar-tered Nitin Fire Protection Industries Limited, or NFPIL, - a provider of fire solutions ranging from basic fire extinguishers to sophisticated fire protection systems and gas-based fire suppression systems - that moment came in 2004, when Siemens India pulled the plug on Nitin's distributorship. "That's when we started getting our international approvals," says Rahul Shah, Director at NFPIL and Chairman Nitin Shah's son. "If Siemens had not walked away, we would not have gone overseas. We would have been confined to India." Getting international approvals for fire protection systems was not easy - it took NFPIL six to seven years to get them. Primary among the approvals include the ones from Underwriter Labs of US and Factory Mutual of UK. Starting with exporting to the UAE in 2012 - today it has its own manufacturing there as well, apart from four plants in India - the company started exporting its products to countries as far apart as Malaysia, UK, and Turkey. So successful has it been in the past three years that exports now account for more than 70 per cent of its revenues of Rs 457.74 crore (standalone, in the year ended March 2014), and growing at an astounding three-year average of 80 per cent-plus. In consolidated terms, its revenues were Rs 1,016 crore in 2013/14, with net profits of Rs 66.5 crore. It provides fire protection for critical assets in different industries - oil refineries, power plants, nuclear plants, etc. It's goal? "We want to be a billion-dollar company by 2020," says Nitin Shah. That's huge growth in five years, not an easy target. So, how does NFPIL aim to do that? By growing organically and also by acquiring companies in the Gulf, Europe and Africa. "Certainly, the growth looks possible going by their numbers," says Suganya Rajan, Industry Analyst, Energy and Environment Practice, Frost & Sullivan. "They have an order book of about Rs 2,000 crore; they are also working aggressively for the World Expo 2020 in Dubai." Rajan, however, is unsure of the potency of the acquisition strategy, because while the outlook for the industry in Europe isn't that good and companies might be willing to sell off, the picture in the Gulf and in Africa is quite different. "I'm not sure if companies there would be willing to sell off to Nitin," says Rajan. 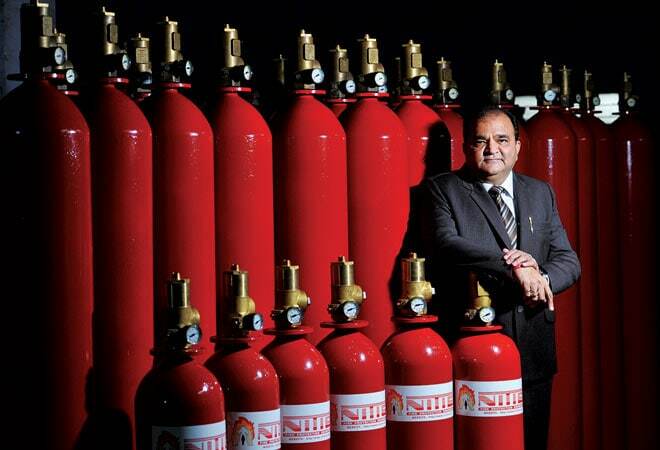 If NFPIL reaches $1 billion revenue, it would be quite an achievement for Nitin Shah, who started the business by maintaining portable extinguishers in offshore oil drilling rigs and power plants in 1984. His first order for supply of extinguishers came from the Department of Atomic Energy. Value: a princely Rs 10,000. Thereafter, the company started making strides in India. From fire extinguishers, it moved to making fire suppression and detection systems. It got its first really big order in 1995, to protect the telecommunication sites of Tata Teleservices in Hyderabad, for Rs 1 crore. Its turnover at that point was Rs 88 lakh. "We have installed more than 4,000 systems in telecom towers in India," says Rahul, for companies including Idea, Vodafone, Aircel and Dishnet. From telecom, NFPIL moved to protecting server rooms, data centres, control rooms of oil refineries, offshore platforms, and manufacturing plants of pharmaceutical and automobile companies, among others. "Every year we get about 200 customers, 50 of which are repeat customers," says Rahul. It counts among its customers companies such as Glenmark Pharma, Maruti Suzuki, Indian Oil Corporation and BPCL, among several others. It's not easy getting business in an industry where NFPIL competes with the likes of global giants UTC, Honeywell, Tyco and Siemens. Frost & Sullivan's Rajan pegs the Indian market for automated fire protection and suppression systems at about Rs 1300 crores (approx $200 million), and growing at 5-6 per cent currently. How-ever, she predicts the market will pick up pace in 2016, and will grow at a CAGR of 8-9 per cent till 2020, driven by the growth in retail, commercial real estate, education and construction sectors. 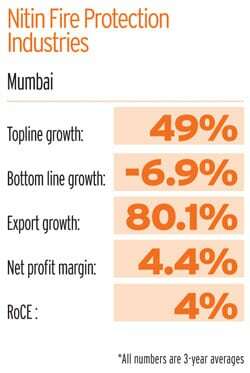 But exports is where NFPIL has really cracked the code. Its biggest customer is in Malaysia - Tenaga Nasional Berhad or TNB, the country's state-owned and largest power company. Malaysia contributes 40 per cent to NFPIL's exports, and TNB contributes the bulk of it. NFPIL had applied for registration as a fire systems provider in 2007, informs Jude Pereira, who runs distribution for NFPIL in Malaysia. The approval was received in 2012 and starting early 2013, about 300 systems have been installed by the company in TNB's sub-stations. Pereira is confident of future growth as well. "Lots of new development is happening in Malaysia compared to Singapore and Thailand," he says. "TNB is also adding 1,000 sub-stations every year." And NFPIL can hope to bag some of them, going forward. The fire in NFPIL's belly is likely to only get stronger.